The SportsZone Field House has four full sized sport-courts equipped for any sport including basketball, volleyball, soccer, baseball, softball or pickleball. Event Type: Team Trainings - basketball, volleyball, soccer, baseball, etc. The Turf Room is the perfect venue for any team sport needing indoor turf. On- and off-season practices can be held for soccer, football, baseball, softball, etc. Event Type: Team Trainings - football, soccer, baseball, softball, etc. The Conference Room is a perfect space for any business or group meeting. It is located on the second floor within the Empey Learning Zone. Room is available for rent only during facility operating hours. Event Type: Work meetings, lectures, trainings, etc. Includes: Table, chairs & large screen T.V. The Multipurpose Room is perfect for a family reunion, baby shower, bridal shower or any other small to medium sized event. ​>Room is available for rent only during facility operating hours (Mon-Sat 8AM-10PM; Sun 9AM-8PM) . Event Type: Baby showers, bridal showers, family reunions, birthday parties, etc. 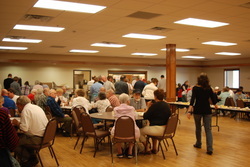 Tittabawassee Township residents receive the resident discount on rentals of the Community Hall. Event Type: Weddings, open houses, family reunions, birthday parties, work parties, etc.